Since 2009, we have successfully delivered multiple Consulting led projects with SAP BW, BOBJ, ABAP, security of SAP across USA. Initially JD Soft has initiated with SAP application Outsourcing, various migration, Integration, SLA based Critical Business Process, Administration and modernisation from legacy version to the latest version of SAP for our partners across US. Advanced BOBJ Services is a suite of advanced pre-built analytics, Management reports, Complex Reporting and executive dashboards that provide 360 visibility into churn reduction, Average user performance enhancement and other business functions. Advanced BOBJ is built using Business Objects software and is delivered through the industry leading JD SOFT Functional Practice (JFP). JFP is a framework that covers all critical processes of a customer insights through an integrated suite of leading business applications. Advanced features such as web-services enabled and integrated with SOA, mobile integration, circulation, mobile approval and integration with Lumira and other third party tools. We offer world-class technology solutions that allows your business to manage tailor-made reporting for the organization based on client’s requirements and design layouts and screens that are consistent with the organization’s requirement. Tech support from ABAP team will result in considerable reduction in the processing time of reports. Using alphanumeric serial numbers for materials, plant wise tax calculation can exempt a specific plant form calculating Basic Excise Duty. 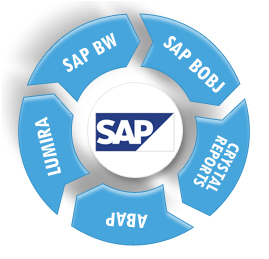 JD Soft internal team have tested Lumira with SAP BOBJ and HANA database. JD Soft has the adequate training of mapping business process with Lumira and deliver expected output. Integrate Lumira with SAP HANA, mobile enablement, leveraging Lumira various kind of trends, age, customer behavioral analysis and many more.